Yes, this is something akin to a call-out. On Friday, it came to my attention hacker-troll-type Jaime “asshurtACKflags” Cochran had her speaking privileges at Suits and Spooks revoked. The organizer Jeffrey Carr changed his mind about her spot on the panel, now comprised entirely of males, because he feared potential “drama.” Carr then repeated this term in a comment on his own blog post, writing “I’m also not interested in gossip or drama around this panel.” The panel Cochran was to speak on included two other members of the same trolling crew she belonged to (Rustle League), along with the infamous FBI informant Sabu, now a pariah in the Anonymous community after radicalizing his teammates and then helping arrest them. Needless to say, gossip and drama has surrounded Sabu’s panel even before Cochran was to speak on it…in fact, the Anonymous community has been up in arms over the panel since it was announced last week. Members of the collective are harassing Sabu right now on Twitter as I type this. Rescinding Cochran’s spot does nothing to alleviate the gossip and drama that surrounds the panel. Further, the choice of words he uses, “gossip and drama” are, no doubt about it, sexist. Gossip and drama are words commonly used to dismiss women, and are gendered words. Carr could have said “controversy” or “argument,” but he didn’t. In an exchange of DMs between the two made public by Cochran, Carr appears to willfully misunderstand Cochran when she says her presence is the counterpoint to Sabu. You know, for the purpose of a balanced panel. He seems to take it as if Cochran would disrupt the panel and fight Sabu, which would cause …. oh no…..drama!!!!! Carr wants none of it, despite asking Sabu, the drama-llama on the panel, to speak. Moreover, in the DM exchange Cochran implied no such thing. But but BUT even if she were to disrupt, this is a conference of hackers. Hackers disrupt. She is a troll. Good trolls troll. That’s what they do. Trolls and hackers belong together, they are of the same tree, the same family of internet trouble-makers. one of the first image results when you google “drama”… notice how one is the opposite of the other? We can’t give Carr the benefit of the doubt for rescinding Cochran because she was a “troll,” someone who by nature causes controversy… because the two other trolls on the panel, of the same trolling crew as Cochran who happen to be men, are allowed to speak. The only difference between Cochran and the other trolls is…. she is not a man. The title of the panel in question, that Cochran was supposed to be a counterpoint of, is “Anonymous Operations and Techniques revealed by Former CabinCr3w and Anonymous Members.” When Anonymous affiliates are running operations, members need to watch out for Sabu-types. How can members of Anonymous protect themselves from being arrested, from being entrapped? From having their teammates turn on them? These questions, and thinking about them, are necessary if Anonymous wants to keep carrying out operations. Social engineering, and recognizing infiltrators, are just as important as technical skills. Cochran possesses both. If her membership in the Anonymous community was any doubt — her being part of a trolling crew that was originally formed to make fun of Anonymous– the largest Anonymous Twitter account YourAnonNews proceeded to tweet support for Cochran. 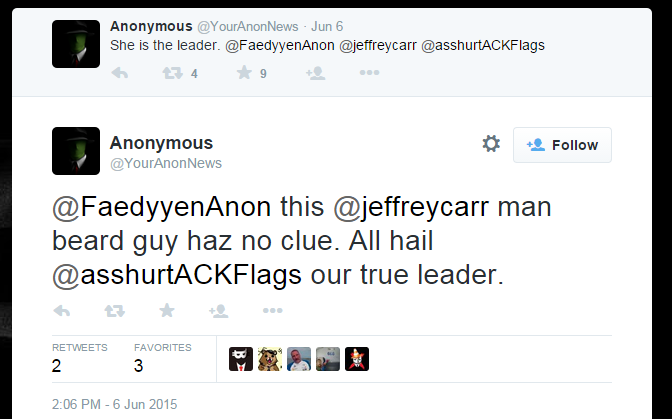 The account even called her the leader of Anonymous. This is, of course, a joke — there are no leaders, in the traditional sense, of Anonymous. There is something to be said for a troll playing a feminist, and using feminist language to get my attention (and if we were to doubt the outcry of “sexism” among the Anonymous community), but I’ve known Cochran for years now, and I’ve always thought of her as a feminist (in the most basic of ways, regarding equality). See, even in this blog post, I am trying to find ways to discredit Cochran in order to uphold Carr, a phenomenon feminists call internalized misogyny. The infosec community has long been lambasted as a sexist industry unkind and unwelcoming to women, and Carr’s reasoning for revoking Cochran’s spot only reinforces that image. He can say it was because she was dishonest, and lying, and causing gossip and drama, but those words themselves reinforce said sexist image. Women in the industry be damned.